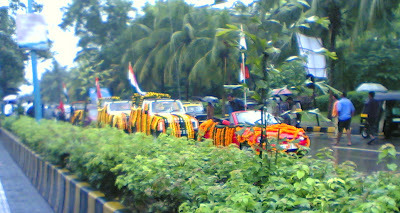 Flower bedecked vehicles lead the cavalcade welcoming home the World T20 cricket champions! Flowers being woven into garlands to decorate the Gods. The festival is bonding time for the ladies of an extended family. Aarti, ãrti, arathi'Aarthi or ãrati is a Hindu ritual, in which light from wicks soaked in ghee (purified butter) or camphor is offered to one or more devas/devis. It is said to have descended from the Vedic concept of fire rituals, or homa. The word may also refer to the traditional Hindu devotional song that is sung during the ritual. Aarti is performed and sung to develop the highest love for God. "Aa" means "towards", and "rati" means "the highest love for God" in Sanskrit. Smaller idols are worshipped at home. The pictures beside the idol are those of Lord Ganesh's parents. His father's name is Lord Shiva and mother's name is Parvati. The Ganesh idol being brought in a truck with great fanfare on the 15thsep07 in Bandra (East). This is the idol being brought for 11days celebration by residents of Bandra (East) who have contributed monetarily and otherwise for this occasion that was popularised by Lokmanya Tilak during India's freedom struggle for mobilising local groups towards the greater cause. Traditional musicians singing hymns accompanying the idol.